I bought my 04 BMW as a new leftover in 2006. At that time it was the perfect bike for me. After 8 years of great riding, I needed to go with a lower, less top heavy machine, something easier to handle in the parking lot; hence the 2012 Victory Vision. I got the (new to me) Vision for Christmas 2013 with 6k miles on it. I've put 2500 miles on the VV this spring and I can't help but make comparisons to the BMW as I cruise about. 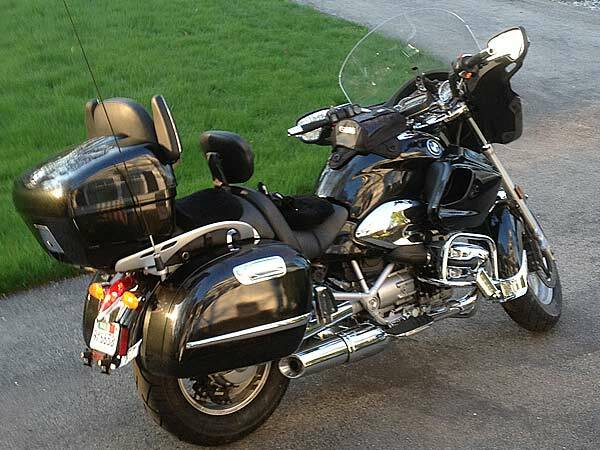 Keep in mind the BMW was dubbed as an alternative to a Harley Electra Glide in 2004. It was a heavy cruiser type with lots of electronics that I definitely enjoyed. Ergonomics: VV wins. The Vision is more comfortable than the BMW. Both bikes have relaxed upright seating but the Vision's lower seat (26.5" vs. 29.3") and deeper padding result in a better ride. The VV's seat narrows in the front which makes it easier to flat foot the bike at stops. The stock VV handlebars fit me better; I had to add risers to the BMW to get the bars up and closer to me. The floorboards are longer on the Vision but the BMW had a floorboard system that absorbed vibrations better. I have a 29" inseam. Engine: VV wins. The Vision's air/oil mill can't be beat. I'm sure every VV owner knows but here are the specs: 1731cc, 97 hp, 109 ft. lbs of torque, takes 91 Hi Test gas but I run 89 medium. I average 44 mpg on my daily round trip rides to work about 70 miles, highway and secondary roads combined. I usually shift between 2000 and 4200 rpm. The BMW has an 1170cc, 61hp, 72ft. lbs of torque, takes Hi Test but I also used Medium. I got the same 44 mpg average. I shifted at about the same rpm. The VV has so much power, the BMW was adequate. The Vision's engine is better looking than the BMW's. The Vision's exhaust sounds better. Drive train: BMW wins. Both have 6 speed transmissions with true overdrive. The BMW's short throw, quiet shifter coupled to a driveshaft produced less lash and felt more refined than the VV carbon fiber belt. The BMW also has a stock heel/toe shifter. I added the Victory heel shifter which is just ok. The VV transmission feels strong and solid but I don't care for the loud clunk as I drop it in first gear. Windshield: VV wins. The Victory's adjustable shield is far better than the strange "M" type screen on the BMW. I did upgrade the BMW to a Cee Baily screen, it still was lacking. Highway Riding: This is a toss-up. The Victory seems to get buffeted around more from the wind and tractor trailer "wash" but is so comfortable. The BMW is a bit noisier at highway speed but had less wind buffeting. Passenger comfort: VV wins. The Vision's oval backrest and plush seat are superior to BMW's pillion. The additional rear speakers are a nice touch. The BMW has a pre-load adjuster for the rear shock but the VV's air shock properly inflated provides excellent dampening and is more forgiving. Passenger Arm Rests: BMW wins. The Vision's factory type rail mounted units are no match for the BMW's flip down trunk mounted units. The BMW's were so solid my wife could use them as a grab point to get on the bike. Brakes: BMW wins. The BMW's EVO brakes on paper are similar to the Vision's. That's where the similarities end. Both have ABS, dual 4 piston calipers up front and a single dual piston caliper in the rear. The BMW has 12" front rotors and an 11.2" rear. The Vision has 11.8" rotors all around. The BMW has the luxury of a Bosch power booster which made this bike stop on a dime. I never have had a bike with brakes as good as the BMW. They bit so hard many R1200CLC riders dumped their bikes in a parking lot by hitting the brakes too quickly. Not me (of course). Suspension: VV wins. The Vision's air suspension makes for a better ride. The BMW's front TeleLever design kept the nose from diving under the massive force of its front brakes but bottomed out over large potholes. The Vision is so very smooth and the air adjustable shock works great. Tires: Don't know yet. The Vision's Dunlop Elite IIIs have been on there for 8600 miles and look good. The BMW's Michelin's went 19k before I replaced them. Body fit and finish: BMW wins. The metal and chrome of the BMW was first rate. I had no squeaks, rattles or groans. The plastic of the VV looks as good but I don't think it will hold up as well for the long run. It's also noisy. Instrumentation: VV wins. The dash is beautiful and functional. The trip computer, fuel gauge that is accurate, gear selection indicator and sound system are better than what came with the BMW. The blue lights are so great at night. The BMW had a large CD player with a fan located in the right rear saddlebag. I used it only once to see if it would work. Took up quite a bit of storage space. Front Fairing and headlights: VV wins. The Vision's fixed fairing design is superior to the batwing handlebar mounted design of the BMW. I believe this is a major factor in low speed maneuverability. The Vision weighs 169 lbs more than the BMW but is easier to handle due to the fixed fairing, lower seat, and the lower center of gravity. The taillight and the newer designed HID lamps are superior also. Engine heat: BMW wins. The BMW's air/oil cooled motor never got as hot as the Vision's. When it did get hot in traffic, as soon as you started to move it cooled down quickly due to the longitudinal mounted cylinders which grabbed the air from three sides. No lowers needed, I never got a hot foot on the BMW. If I didn't have the Air Wings installed on the Vision, riding in 80 degree weather would just be hurtful. Handling: VV wins. The Vision handles like a true sports tourer, just amazing for such a big bike. The BMW was good for a cruiser but nothing like the Vision. The bottom line is that I am very pleased overall with my Victory Vision purchase. I'm sure I will get many years of fun riding with it. Nothing is perfect but the Vision is a great combination of power and comfort. I do believe that Victory needs to do more to keep the engine heat management issues away from the rider's feet and legs. Perhaps an auxiliary oil cooling system or precision liquid cooling or venting and thermo actuated fans would help. Final thoughts: The Vision brakes are a major concern. They are barely adequate for this bike. If the BMW's brakes were fitted to the Vision, it would be a great improvement. Victory should also look into more electronic engine and suspension management such as switchable engine mappings and dynamic traction and stability control. I believe that's where the future of motorcycle riding is heading. That said, if only Moto Guzzi would add a full tour pack and an audio system to its California 1400; hmmmm. That would be worth considering some day. The other problem for me is my motorcycle garage. I have a brick path 40 feet long to traverse backwards to get to my driveway. I realize the electric reverse on most large bikes isn't meant to go backwards for those distances but to get me started and over the doorway threshold and on to the path would be very helpful. I installed the Victory Factory Arm rests for her, she likes them but when she is not riding behind me they become another source of noise and squeaks. 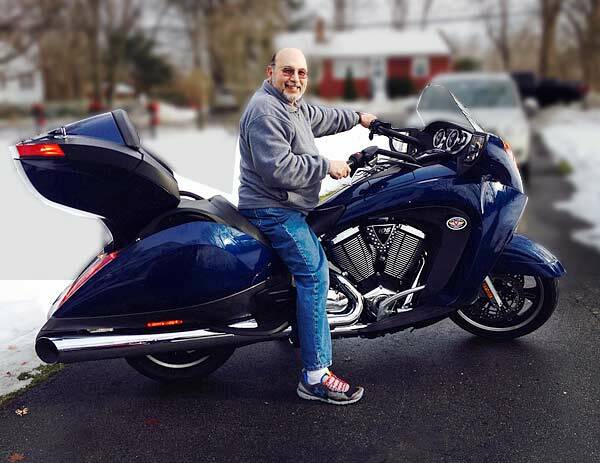 I have a 2015 Goldwing 40th Anniversary addition coming. This ought to be a good compromise for both of us. I hope I will enjoy it as much as the Victory.